If I could manage to write more than a Rotten Tomatoes style review of this production, I’d be happy to oblige the cast, crew and audience with a checklist of every outstanding point this show delivers. There just isn’t a need. In its execution: acting, direction, stage direction, costuming, timing, scenery, sound and lighting, comedy, fight choreography and just plain ‘shock & awe’, Punch and Judy is absolutely flawless. This is NOT your children’s puppet show Punch and Judy. 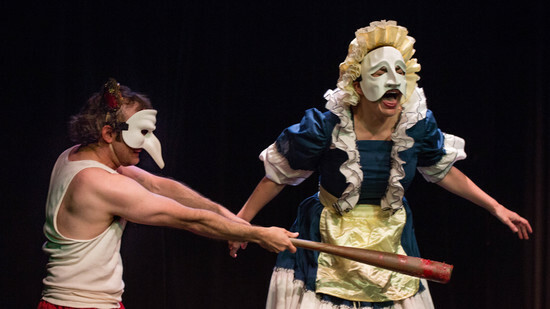 It is a colorfully violent, sexual and irreverent adaptation written from substantive historical research on the actual character origins and how they were veritably performed long before Punch was boiled down to a mere cranky wife beater. It goes so so, so, so, so (there just aren’t enough ‘so’s) much farther. You won’t even believe. This ‘punch-drunk’ 50 minutes jaw-dropping, blood, guts and action-packed sketch has woven a variety of theatre and film craft genre’s into a very adult, hilarious, dark physical comedy that will have you yelling out loud in response and defense. Unfortunately there are no more shows left for Fringe.